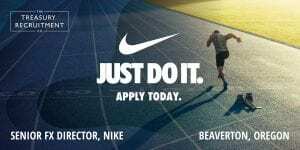 Senior Director of Foreign Exchange for NIKE based in Beaverton, Oregon USA - The Treasury Recruitment Co.
We are delighted to have been retained to recruit a Senior Director of Foreign Exchange to work for NIKE in their company headquarters based in Beaverton, Oregon. NIKE, Inc., is an American multinational corporation and a world leader in the design, development, manufacturing, and worldwide marketing and sales of footwear, apparel, equipment, accessories, and services for a wide variety of sports and fitness activities. Operating segments for the NIKE brand include: North America, Europe, Middle East and Africa, Greater China, Asia Pacific and Latin America. Reporting to the Vice President of Financial Risk Management, the Senior Director of Global FX Risk Management will lead NIKE’s FX Risk Management team, including team members in North America, Europe, and Asia. 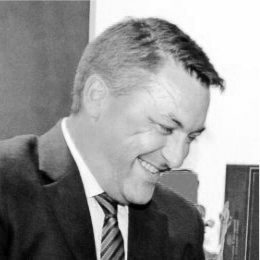 Ideally, you will be a graduate in a Business, Finance, Accounting or related degree as well as a corporate treasury professional with at least 10 years of treasury experience gained within a multinational corporate. You will have a deep understanding and expertise in foreign exchange/trading at a large multinational corporation as well as broad treasury experience, with at least 3 years in functions other than Foreign Exchange. You will be working at the global headquarters of the world’s leading sports brand. You will play an integral role in the management and development of FX risk management for the global enterprise. The role itself forms part of the talent succession plan for both Treasury and Finance as a whole. This is a unique opportunity to make a real difference to the success of the company. If your experience matches this role and you wish to apply for this exciting position, then please send your resume, details of current remuneration to NIKE’s retained consultants at The Treasury Recruitment Company. Any resumes sent to NIKE either directly or via another agency will be forwarded to The Treasury Recruitment Company. Please note you must already have a VISA to work in the USA or be a US citizen to apply for this role – sponsorship will not be offered.